, a celebrated philosopher, was a native of Kresium, a maritime town in Lesbos, aud was born in the second year of the 102 olympiad, or B.C. 371. After some education under Alcippus in his own country, he was sent to Athens, and there became a disciple of Plato, and after his death, of Aristotle, under both whom he made great progress both in philosophy and eloquence. It was on account of his high attainments in the latter, that instead of Tyrtamus, which was his original name, he was called Theophrastus. During his having charge of the Peripatetic school, he had about two thousand scholars; among whom were, Nicomachus, 1 the son of Aristotle, Erasistratus, a celebrated physician; and Demetrius Phalereus. His erudition and eloquence, united with engaging manners, recommended him to the notice of Cassander and Ptolemy, who invited him to visit Egypt. So great a favourite was he among the Athenians, that when one of his enemies accused him of teaching impious doctrines, the accuser himself escaped with difficulty the punishment which he endeavoured to bring upon Theophrastus. Under the archonship of Xenippus, Sophocles, the son of Amphiclides, obtained a decree (upon what grounds we are not informed) making it a capital offence for any philosopher to open a public school without an express licence from the senate; on which all the philosophers left the city; but the next year, this illiberal legislator was himself fined five talents, and the philosophers returned to their schools, and Theophrastus, among the rest, now continued his debates and instructions in the Lyceum. 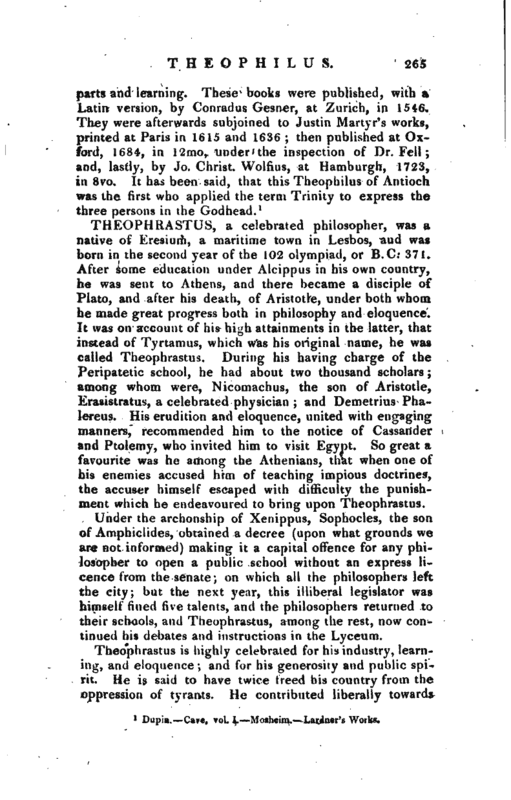 Theophrastns is highly celebrated for his industry, learning, and eloquence and for his generosity and public spirit. He is said to have twice freed his country from the oppression of tyrants. He contributed liberally towards | defraying the expence attending the public meetings of philosophers, which were held, not for the sake of show, but for learned and ingenious conversation. In the public schools, he commonly appeared, as Aristotle had done, in an elegant dress, and was very attentive to the graces of elocution. He lived to the advanced age of eighty -five; towards the close of his life, he grew exceedingly infirm, and v\us carried to the school on a conch. 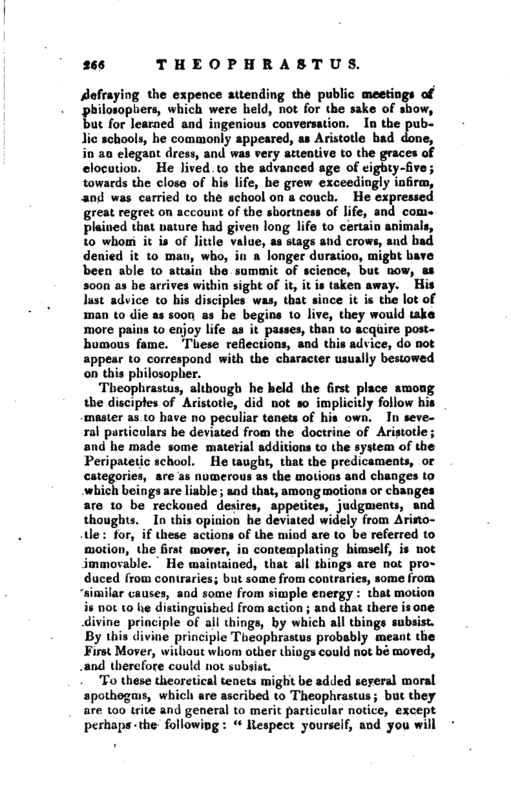 He expressed great regret on account of the shortness of life, and com* plained that nature had given long life to certain animals, to whom it is of little value, as stags and crows, and had denied it to man, who, in a longer duration, might have been able to attain the summit of science, but now, as soon as he arrives within sight of it, it is taken away. His last advice to his disciples was, that since it is the lot of man to die as soon as he begins to live, they would take more pains to enjoy life as it passes, than to acquire posthumous fame. These reflections, and this advice, do not appear to correspond with the character usually bestowed on this philosopher. Theophrastus, although he held the first place among the disciples of Aristotle, did not so implicitly follow his master as to have no peculiar tenets of his own. In several particulars he deviated from the doctrine of Aristotle; and he made some material additions to the system of the Peripatetic school. He taught, that the predicaments, or categories, are as numerous as the motions and changes to which beings are liable; and that, among motions or changes are to be reckoned desires, appetites, judgments, and thoughts. In this opinion he deviated widely from Aristotle: for, if these actions of the mind are to be referred to motion, the first mover, in contemplating himself, is not immovable. He maintained, that all things are not produced from contraries; but some from contraries, some from similar causes, and some from simple energy: that motion i* not to he distinguished from action; and that there is one divine principle of all things, by which all things subsist. By this divine principle Tneophrastus probably meant the first Mover, without whom other things could not be moved, and therefore could not subsist. 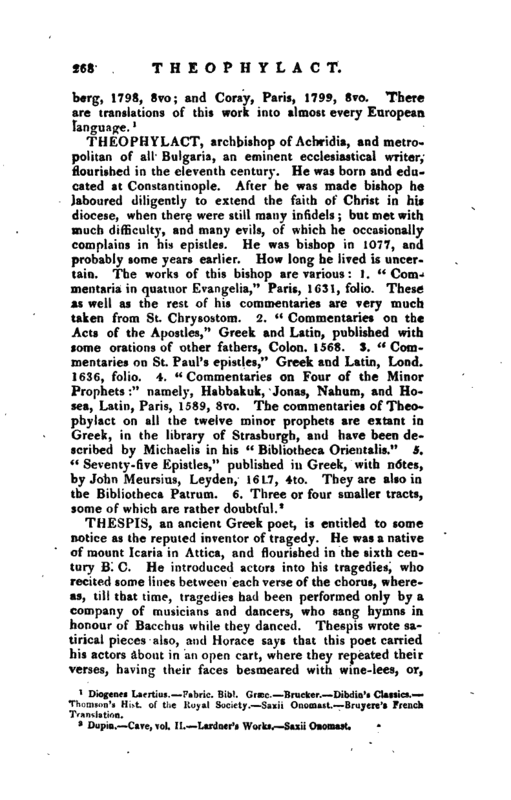 To these theoretical tenets might be added several moral apothegms, which are ascribed to Theophrastus; but they are too trite and general to merit particular notice, except perhaps the following: “Respect yourself, and you will | never have reason to be ashamed before others.” “Love is the passion of an indolent mind.” *‘ Blushing is the complexion of virtue." In imitation of his master Aristotle, he composed a great Dumber of works; and, indeed, we do not find that any of the ancients exceeded him in this respect. Diogenes Laertius reckons up more than two hundred different tracts, and the subjects of which they treated; but the greatest part are lost. Those that remain are, nine books of the* “History of Plants-,” six of the “Causes of Plants;” a book “Of Stones” “Of Winds;” “Of Fire;” “Of Honey” “Of the signs of Fair Weather” “Of the signs of Tempest;” Of the signs of Rain“Of Smells;” *’ Of Sweat“<* Of the Vertigo” “Of Weariness” “Of the Relaxation of the Nerves;” “Of Swooning;” “Of Fish which live out of water” “Of Animals which change their colour;” “Of Animals which are born suddenly” ?‘ Of Animals subject to envy“and,” The Characters of Men." 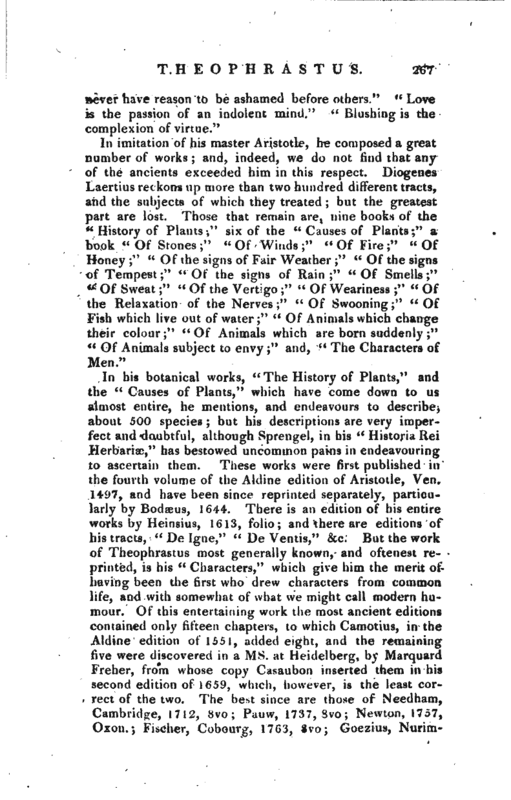 Diogenei Laertius.—Fabric. Bibl. Græc.—Brucker.—Dibdin’s Classics— Thomson’s Hist. of the Royal Society.—Saxii Onomast.—Bruyere’i French Translation.